Parts list and additonal info for a 7S build of the Stuart Pittaway DiyBMS project. Prices and links are in Australian dollars. I ordered the PCBs from jlcpbc.com by just zipping and uploading the gerber files from the main project. I purchased a handfull from Australian and Chinese based ebay sellers with no issues. I bought ones based on/clones of the NodeMCU design. It's important to note that the square USB chip chip is a CP210x chip and this needs drivers. On macOS you need to make sure you give the installer permissions to install the kernel extensions. The Adum1250ARZ chip is quite expensive ($8.59 AUD), rather than buy 7 or more of them upfront I tried two alternatives that are both working well for me as drop in replacements. Texas Instruments ISO1540QDRQ1 . Same pin out and costs $7.31 from Element14. A cheap ebay listing "5PCS X ADUM1250ARZ DGTL ISO 2.5KV 2CH I2C 8SOIC" - $2.07 each. There has been some discusison on the correct value of R2. Adam Welch has used 510 ohms (so have I) but Stuart has used 47 ohms. Ultimately it depends on how bright you want the LED and how much power draw you want it to add to the main resistor when discharging a cell. An alternative to the 510R resistor below is 47R - Yageo RC1206FR-0747RL. Similar with R1, it depends a bit on how quickly you want the BMS to discharge a cell. I have picked 2.2 Ohms, you can also go with the value marked in the schematic with 3R3 - HS50 3R3 J 50W Axial Wire Wound. These resistors are also far cheaper on ebay for under $2 a piece. A range of values are at this listing: 50W Aluminum Clad High Power Wirewound Resistor 0.5/1/2/2.2/4/6/8/10/20 R Ohm. It's best to keep the wire lengths between the boards as small as possible. To do the smd soldering I purchased a ATTEN AT 858D clone from ebay named "Yihua 858D" for $59.89 AUD delivered. These devices are known to arrive with bad electrical defects, prior to using it I checked it's internals by following this guide. So far I have had no issues with my model, it works very well, but I keep it unplugged when I'm not using it. I plan to 3D print a stencil based on Colin Hickey's sencil generated at http://solder-stencil.me, however purchasing solder paste that came with a very fine nozzel/tip has been fine for placing solder on the pads of the boards. 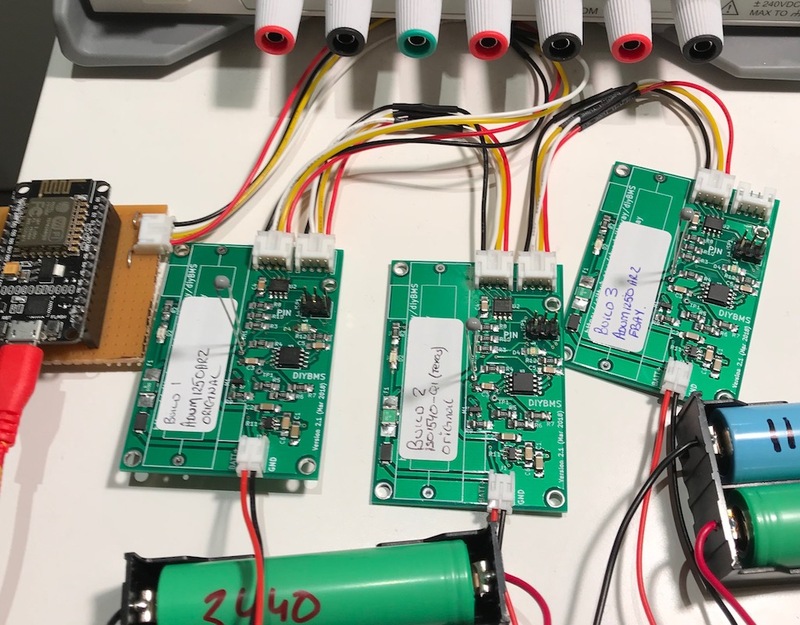 I've put together three boards to test the different isolator chips and was able to get it all working and reporting to emoncms without any modifications to Stuart's code, just by making sure I soldered things properly and sanity checking things by following along with Adam Welch's videos. I have not included any JST wires (only the PCB connectors) in the list. These are easy to find on eBay.